Jack and the Beanstalk Craft – Make Your Own Giant Beanstalk! 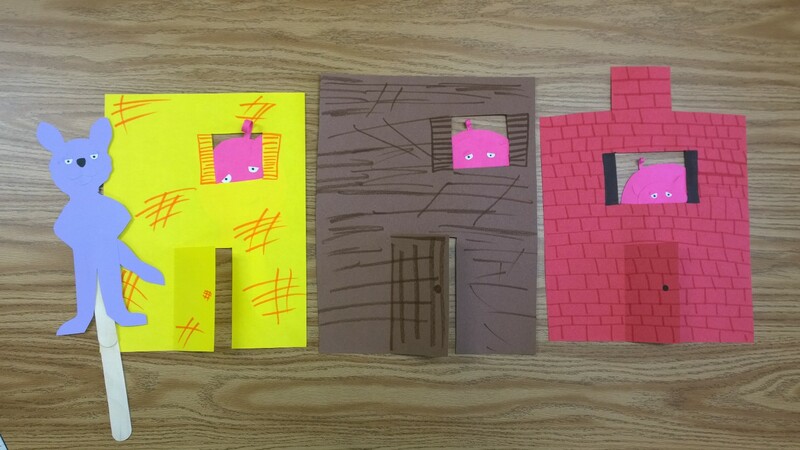 For this Three Little Pigs crafticity, kids create their own re-telling puppets and houses out of construction paper and popsicle sticks, then play with their creations. See the pictures below for inspiration & follow the instructions to get started with your own home or classroom set! Make Three Little Pigs Puppets. 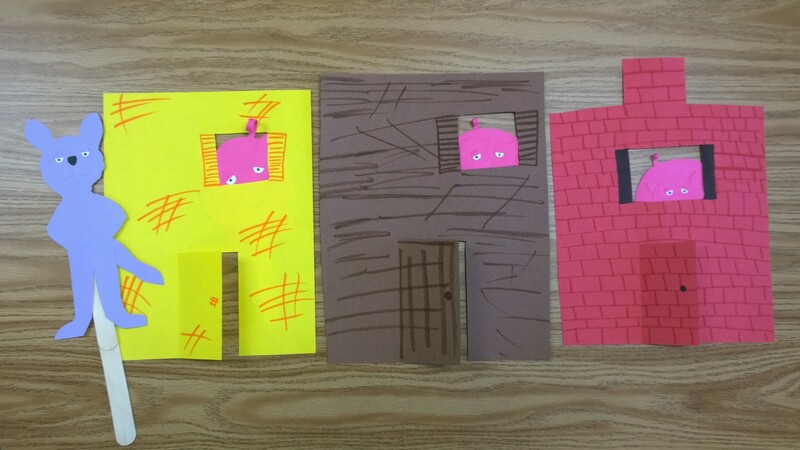 Cut circles out of pink construction paper to make each pig’s face and body. Add rectangles for legs. Add Eyes, Ears, and a Curly tails made out of a thin strip of curled construction paper to each puppet. Tape a Popsicle stick to the back of each puppet. Draw pupils, nostrils, and mouths with a black marker. 2. Make The Big Bad Wolf Puppet. 3. 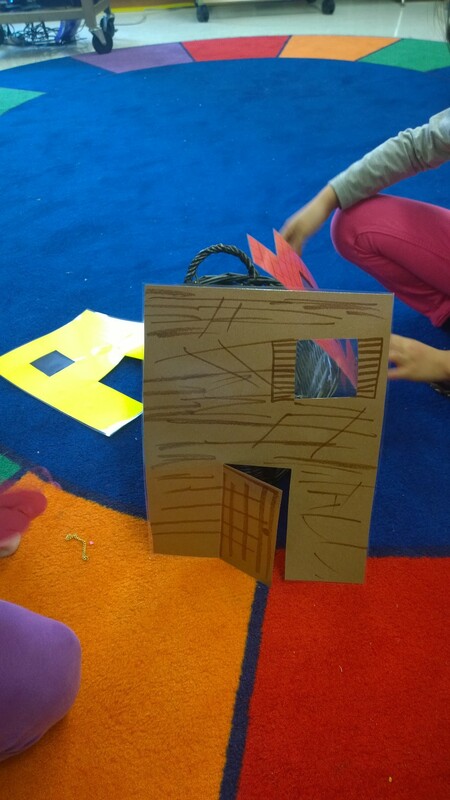 Make The Three Little Pigs’ houses. Take a piece of yellow construction paper and cut out a window and a door. Decorate it with an orange markers so it looks like a straw house. Use a piece of brown construction paper to make a house made of sticks. Add details with a brown marker. Create a house made of bricks. Cut out a chimney, and draw on bricks with a red marker. Add a door knob and shutters with a black marker. Kids introduce the characters to the set and play by arranging the puppets and houses in different positions. Kids re-telling the story of The Three Little Pigs and The Big Bad Wolf in the classroom. If you need a fun pig craft then this is the perfect project for you! For this barnyard craft you will be using different colors of construction paper to create a farm scene with a pig and some crows. The pig pokes his head and nose out for a cool 3D effect. For this craft, you will need glue bottles, construction paper in a variety of colors, and scissors. and glue them into place. For the pig, cut three circles out of pink construction paper. Arrange the circles in order from biggest to smallest on the background. Take a strip of construction paper and fold it into a “Z” shape. Glue the head onto one side of the “Z” and then glue the other side of the “Z” to the nose. This creates a 3D effect of the nose popping out from the face. Do this again to connect the body to the head. You may need to use a fatter strip of paper to connect the head to the body. The eyes are made by cutting small circles out of white construction paper. The pupils are made with black construction paper. If you fold a small piece of black construction paper in half and then cut out a very small circle, you will have two pupils of the same size. Cut out the nostrils in the same manner and glue into place. Cut out a mouth shape with black construction paper and glue it into place. are poking out a bit. Make the tail by cutting a long, thin piece of pink construction paper and rolling it up around a pen to make it curly. Tuck the tail behind the body to complete the pig. Add construction paper grass by taking a long, thin strip of green construction paper and snipping it along one side. Try to cut about half way through. If you accidentally cut the grass in half, its okay – just paste it onto your paper in two pieces. Finally, add some crows to complete the farm scene! Instructions to make a 3D pig face craft that you can hang up on the wall or use as a puppet. Put three of these piggies on a stick and have a Three Little Pigs puppet show. Need a big bad wolf? Use the black cat template. Start by making a fortune teller out of construction paper. Click here for some directions on making a fortune teller (sometimes also called a “Cootie Catcher”). Staple the top and bottom sections together to create a mouth that only opens in one direction. To make the pig’s nose: Glue a piece of construction paper around a cylinder shaped block. Hold the paper around the block until the glue dries. Cut a triangle shape out of the end of the nose piece and attach it to the fortune teller with some glue. Hold the construction paper in place until the glue dries. Your pig is going to look like an elephant at this point. Trim the nose to make it shorter like a pig’s nose would be. glue and then carefully placed inside the nose to help it stick. Glue on two small black construction paper nostrils. Cut out triangles from red construction paper and glue on the inside of the mouth as shown in the picture. This part can be a little tricky as you need four triangles to fit nicely in each section of the mouth. When you make one that fits you can use it as a template and cut three more in the same shape. Glue these pieces inside the mouth. Cut two triangles to make ears and add smaller triangles to those to complete the ears. Glue the ears onto the back of your pig’s head. Cut out two pink squares and glue them to the back of the fortune teller to make cheeks. Trim off the excess paper with scissors. Create eyes by cutting out two small circles of white construction paper. Cut two smaller black circles to make pupils. Make eyelids with half circles of construction paper. Glue the pupils onto the eyeballs and then glue the eyelids on. around a pencil. Cut them in half so you have two sets of eyelashes and then carefully glue them onto the eyelids. Finally, push a small nail through one of the folds on the back of the fortune teller to create an anchor. Place a loop of string or floss on the nail and attach it to the wall with a tack. Hello and welcome to my teaching blog for all things Kindergarten and PreK! I'm Miss Vanessa and I live and teach in Colorado, USA! You can visit My Store on Teachers Pay Teachers to view and download my original teaching resources! Do you have a question, comment, suggestion, idea, activity to share or custom request? I'd love to hear from you!! You can send me an email: vlrynn@gmail.com and I'll get back to you soon! Thanks so much for stopping by! Jack and the Beanstalk Craft - Make Your Own Giant Beanstalk! 18 Educational Music Videos for Early Learning ~ Alphabet, Counting & More!